The final book in the Throne of Glass series as finally arrived. I was so excited to get my hands on a copy! I love this series. I devoured the first five books in about two weeks. When I say devoured, I did nothing else those two weeks. I read. I read until I was falling asleep. This series inspired me to write my own high fantasy (which is set to publish in spring of 2018 with Authors 4 Authors Publishing). I adored the first four books, but this last one… my goodness it took FOREVER to get through. From my writer’s point of view, here’s what I think happened: the first few books were heavily edited because that’s how it goes. Then this book, which the publisher knew would sell and make plenty, didn’t receive the same level of editing. This book could have easily been cut by fifty thousand words without losing any of the story. There are places where something was thought or mentioned, and then that same thing was mentioned or thought a page later or the next time that character appeared. Needless repetition made this book longer than it should have been. By about 3/4 through, I starting skimming sections. I was ready for the book to be over. It just didn’t feel like anything was happen. The first two books moved so fast, and this one just… dragged. Aedion’s first several scenes were boring as hell, and he and Lysandra’s relationship became melodramatic – like Soap Opera style. Dorian’s scenes were so slow to move, but picked up. He became one of my favorite characters. Like the rest of the series, I skimmed Manon’s scenes. I skipped her scenes when they first appeared – I don’t know what book that was – because they didn’t interest me. I like Manon, I just find her story boring. I didn’t want to have to get into yet another character and story. Maas did that thing that a lot of high/epic fantasies do that I can’t stand – adding too many characters with their own stories. It ends up feeling like I’m reading four books at once. And, this final book had that “every moment must be the most dramatic moment yet” thing, and after a while everything feels melodramatic and over-the-top. Still, with all my whining and complaints, I still love this series. This series reminded me why I love to read and why I love fantasy. Before this series, I read sporadically. Inconsistently. After this series, I am reading constantly, sometimes two or three books at once. 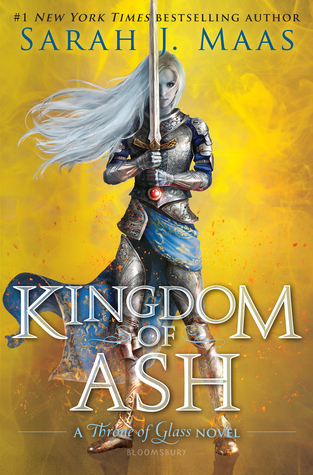 So, Kingdom of Ash gets a 4 out of 5 from me. While I love the story, this book was too long. Overall, the Throne of Glass series is still a must-read for any fan of fantasy. My biggest beef with this series is that the first two books had me hooked. I loved the assassin/prince vibe. I did not care as much for the “fae” vibe. It’s never been one to hook me. The later books felt different than the first books, not only in writer style (Maas’s writing improved) but in setting and character. Aelin started out as such a fun, interesting character. She had a flare for the drama, for fun, for nonsense – she had a little “Jack Sparrow” to her, which I loved. She lost that somewhere and become too serious, and then at the end of Kingdom of Ash, that first Aelin appeared again, and those parts read so much quicker. Still, I’d give this series a 4/5 – because while it has its flaws, it is still an amazing story. It felt that empty feeling behind when I closed the back cover of Kingdom of Ash. ‹ Previous2019, Here I Come!